Gabriele Rossetti, the father of the artist, was an Italian poet who lived in England as a political refugee, and became Professor of Italian at King's College. His son, naturally enough, was in due course entered as a student at King's College School, where he remained for seven years. He gave early evidence of his talent for art, and on leaving school he took up his studies in Cary's Studio, in Bloomsbury, going to the Academy " Antique" School for a year at the age of seventeen. Millais and Holman Hunt were fellow- pupils, and in 1848 they helped to found the celebrated Pre- Raphaelite Brotherhood. 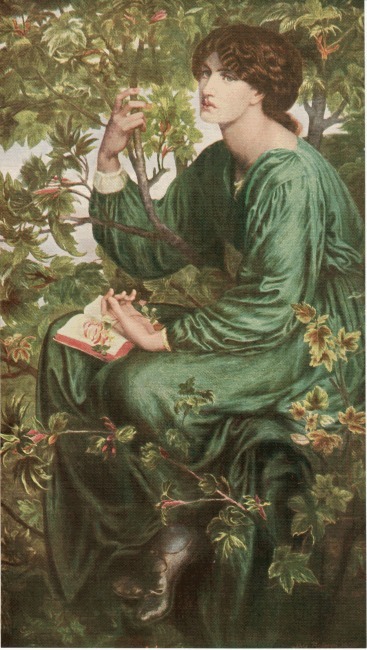 Rossetti derived great benefit from this association, for his first picture was painted under the guidance of Holman Hunt and in his studio. In certain respects Rossetti was the most interesting member of the Brotherhood. He scrupulously followed the delineation of natural detail and effect, but he added the study of intense poetic expression on his own account. This was because he was a poet as well as a painter, a dreamer of dreams as well as an interpreter of visions in the light of tangible things. His favourite subjects were those derived from medieval history, the " Vita Nuova" and English ballads; only on one occasion did he engage upon the illustration of the modern story. In 1857 he illustrated Tennyson's Poems, and helped in the decoration of the Union Debating Hall at Oxford, and this period was productive of some of his finest work. He was facile in water-colour as well as in oil; and he did some noteworthy decorative work, of which his altarpiece " The Adoration of the Magi," for Llandaff Cathedral, may be mentioned.